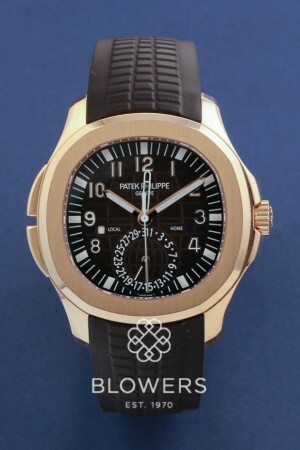 Patek Philippe Aquanaut Travel Time.Ref 5164R-001. 40.8mm diameter Rose Gold case. . Water resistant to 120 metres. Automatic PP movement caliber 324 S C FUS. 29 Jewels, 294 parts, 28,800 VPH, power reserve 35-45 hours. Dual time zone mechanism indicating local and home time. Local and home day/night indications in apertures. Brown embossed dial with white Arabic hour markers, luminous hands and outer minute track hour markers, date sub dial at the 6 o’clock position, central second sweep. Sapphire crystal see through case back, brown rubber strap with double folding clasp. Box and papers date December 2017. SKU: 3034322. Categories: Aquanaut, Patek Philippe.